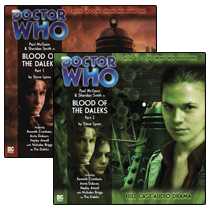 TWO FREE AUIDO BOOKS: BLOOD OF THE DALEKS PARTS 1 & 2! GET 25% OFF BIG FINISH DARK EYES #1 AND DARK EYES #2! SAVE 10% ON THE COVER PRICE! FREE U.S. DELIVERY DIRECT TO YOUR MAILBOX! Gabby and the Doctor are back in New York after a terrifying excursion into the past, catching up with family and friends... until THE ECHO strikes, amplifying everyday noise into ear-shattering, mind-splinteringly debilitating waves of sound. What is the Echo – and can the Doctor and Gabby solve the mystery before the cacophany drives the city mad? Plus: "Doctor... you are coming back?" The fantastic Elena Casagrande and Arianna Florean return on art duties, taking us through to #15 and the end of the first season! BBC logo © BBC 1996. Doctor Who logo © BBC 2009. Dalek image © BBC/ Terry Nation 1963. Cyberman image © BBC/Kit Pedler/Gerry Davis 1966. K-9 image © BBC/Bob Baker/Dave Martin 1977. Licensed by BBC Worldwide Limited.